Question – Define International Marketing. 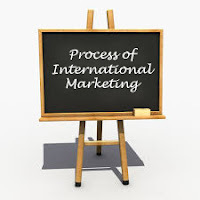 Explain the steps involved in the process of international marketing. 2. Research and Analysis – Market research is done to Analyse the organization’s strength and weakness, opportunities available in international markets, and threats in international markets. 3. Decision to Enter International Markets – After identification of potential opportunities in international market decisions are taken to enter international market. Such decisions include – identification of potential buyers in international markets, demand measurement and forecasting, market segmentation, market targeting and market positioning. 4. International Marketing Mix – At this step international marketing mix is developed. Marketing mix identifies four key areas – Product, Price, Place, and Promotion for developing a well coordinated marketing strategy. 5. Consolidate Marketing Efforts - Developing a good marketing program is not enough a marketing organisation need to manage the international marketing effort properly. Marketing organisations also need proper analysis, planning, implementation and control of their marketing efforts.